Photos and videos courtesy of Jeff Molander's father. Check it out as we upload Historic Race videos! All 2010 Historic Races videos are uploaded to YouTube and listed in the spreadsheet below (which can be filtered to make searching and watching easier)..
event post for more information. The 12th annual Davis Meet was held on May 1st and 2nd. Formerly a one-day people’s choice show and swap meet, the meet evolved this year to include an autocross on the day before the show, providing a full weekend of Volvo-related activities. The Golden Gate & Sacramento VCOA Chapters co-hosted the meet and autocross, which raised funds for chapter activities throughout the year. The weekend started on Saturday with an Autocross event at the former Mather Air Force Base, about 15 miles to the Southeast of Sacramento near Rancho Cordova, California. The Autocross event was organized by VCOA member, Mark Baldwin and held at the County of Sacramento operated “Emergency Vehicle Operations Center” in association with the Sacramento Chapter of the Sports Car Club of America (SCCA) and volunteers from the Rancho Cordova Police Department. The track which is usually laid out with courses to train enforcement officials and government personnel was modified to support the autocross event. In total, 25 Volvo drivers with novice to experienced autocross driving skill participated in the fun event. Cars ranged from P1800’s to C30’s. Each of the 25 vehicles ran 4 heats during the course of the day. Everyone agreed that this was a great way to start the annual Davis Meet. Autocross winners. Photo by Kevin Sellstrom. A special thanks for the cooperation of volunteers from the Rancho Cordova Police Department and SCCA member Ray Miller who laid out the track and helped to organize and oversee activities for the event. As recognition for their support, all entry fees were donated to the Rancho Cordova Police Activities League (PAL), an organization focused on youth crime prevention, activity development and leadership in the community as a charitable contribution. Sunday’s show and swap meet consistently draws the Volvo faithful from as far away as Southern California, Oregon, Washington, and Nevada, and this year was no exception. Davis is a small college town just West of the State capital of Sacramento, and is home to a branch of the University of California. Davis’ downtown area is home to numerous small shops and restaurants, as well as Central Park, the home of the VCOA Davis meet. Originally, all of the Volvos and attendees fit under the canopy on the East side of the park. Over the years, the meet has steadily grown in size to where a street closure is needed to accommodate all of the cars. This year’s attendees were once again treated to a wide range of post-war Volvos, from a 445 and a P1900 all way up to current production models. Approximately 105 Volvos were in the show area, representing all conditions from showroom stock to full race cars as well as everything in between. Attendance by model was as follows: (1) 445, (1)1900, (5) 544, (8) 122, (3) 140 series, (1) 164, (8) 1800 coupes, (5) 1800ES, (33) 200 series, (12) 700/900 series, (18) 850, (3) V70R, (4) S60R, (1) XC70, (1)C70, & (1) C30. The swap meet area was once again popular, occupying 29 parking spaces and providing good deals on new old stock items as well as used but new-to-you parts. The enduring appeal of the Davis meet is that there’s something for everyone, if it’s Volvo-related. Whether the discussion centers around restoration techniques, doing race mods, or just finding a good local Volvo mechanic, there’s likely someone at the meet that has the answer. 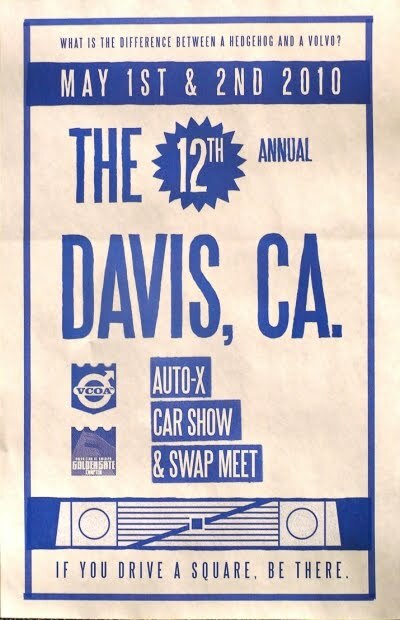 Whatever your taste, old or new, stock or modified, you’ll likely see it at Davis and there is always food, t-shirts, posters, and great raffle prizes. Photos by Kevin Sellstrom and Sac Volvo Club. The First Place award winners received as their “trophies,” license plate frames imprinted with the meet name and their respective award categories. Second place awardees received large award ribbons. AllWaste for donating a trash dumpster. Johnson's Mobile Solutions for donating portable bathrooms. The SacVCOA and the GGVCOA would like to thank Kevin Sellstrom and Joe Hughes for taking the photos and hosting them on their website! Please make sure you take a look at the above link to support these guys' work and their support of the VCOA! On the morning of June 12th, members of the Sacramento Chapter met at IKEA in West Sacramento for an informal show and get-together. There was a single Saab in attendance (a 1972 Sonett), but Volvo models were well represented, ranging from a 1965 1800 to a 2008 XC70. IKEA shoppers viewed the 14 cars on display as they walked to or from the store. After a few hours of chit-chat about the nuances of Swedish cars and some informal demonstrations, including an impromptu test drive of Wally and Marsha Russell’s newly-acquired XC70 wagon, the attendees adjourned to IKEA’s cafeteria for a great Swedish lunch. Afterwards, Sacramento Chapter members held an event planning meeting to organize Chapter activities for the remainder of the year. Casey Turner of Turner Volvo, the Sacramento, California area Volvo dealership, invited local VCOA members to display their cars as a backdrop to a site visit by Volvo of North America to introduce the newly designed, 2011 S60, as part of their “Naughty Volvo Tour.” Ten vintage Volvo’s with their drivers and passengers were present to witness the first unveiling of the new S60 in Sacramento. Company employees covered the virtues and innovative features of the new car in Turner’s showroom following a dramatic introduction where a cover was pulled off of the new car by sales representatives, complete with a musical backdrop. Many VCOA members and other guests were able to experience the new “City Safe Crash Avoidance System,” upfront by signing up and driving the new S60 with a Volvo representative in a second car, outside of the showroom. Participants were able to accelerate forward and then in reverse between a “Volvo Crash Test Dummy” in front, and some orange cones to the rear. Using a radar unit and mirror camera’s, the new Volvo was able to detect the obstructions, apply the brakes, and stop on its’ own within inches of contacting these obstacles. "2010 National Meet, hosted by the VCOA Great Lakes Chapter, August 14-15 at the Gilmore Auto Museum near Kalamazoo MI." Map on main website as listed above. Apple Hill Run on Sunday. Have an idea for the charity event? The Sacramento Chapter’s third annual Foothill Drive began at Wally and Marcia Russell’s home in Pollock Pines CA. The group toured the Apple Hill area east of Sacramento for the day stopping at apple ranches and wineries along a route of “back roads” filled with fall colors and vineyard and orchard views while working their way to Placerville (aka Old Hangtown). Besides muffins and coffee at the hosts’ home, participants enjoyed hot apple donuts, fresh pressed cider, BBQ pork sandwiches, wine tasting and apple desserts. Apple Hill is just one aspect of the historic gold country that attracts thousands during apple season. Parts of the Old Lincoln Highway are in this area. Volvos ranging in age and model from 1962 to 2008 including 544s, 1800s, an 850 and a V70 were all present. We’ll see what the famous Gold Discovery area reveals during the 2011 Foothill Drive. As guests of the EuroSunday club, Chapter members Jeff Molander (1968 122S) and Gary Sellstrom (1974 144E) displayed their Volvos at the Show amidst a wide range of the club’s vehicles. The Show, which was held on 11/12 to 11/14 at Cal Expo (the State fairgrounds) in Sacramento, featured new vehicle displays by auto manufacturers and local dealers, and was sponsored by the Central Valley New Car Dealers Association. The EuroSunday display of 40 vehicles featured exotic and collector cars and motorcycles. Through our Chapter’s participation, Volvo was well represented among such prominent brands as BMW, Ducati, Ferrari, Jaguar, Maserati, and Porsche. The display was the centerpiece of a People’s Choice fundraising show for charity. Showgoers were encouraged to vote for their favorite car or motorcycle; the Dealers’ Association made a donation of $3,000 in the winning vehicle owner’s name to the Shriners’ Hospital for Children in Sacramento. Thanks to Jeff and Gary for bringing their Volvos to the Show, and special thanks must go to EuroSunday (especially Mike, Kym, and Adam) for their gracious invitation to us and all of their hard work in making this event a success.